We had a good trip today on the Mary B III. Caught and released this beautiful Atlantic Sailfish for the groom-to-be, the day before his wedding! 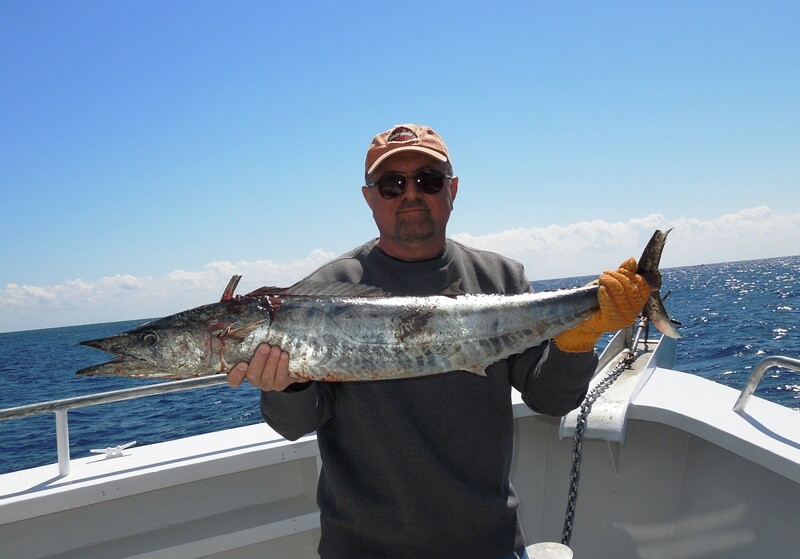 We also caught a nice wahoo on the trip, another nice gamefish. 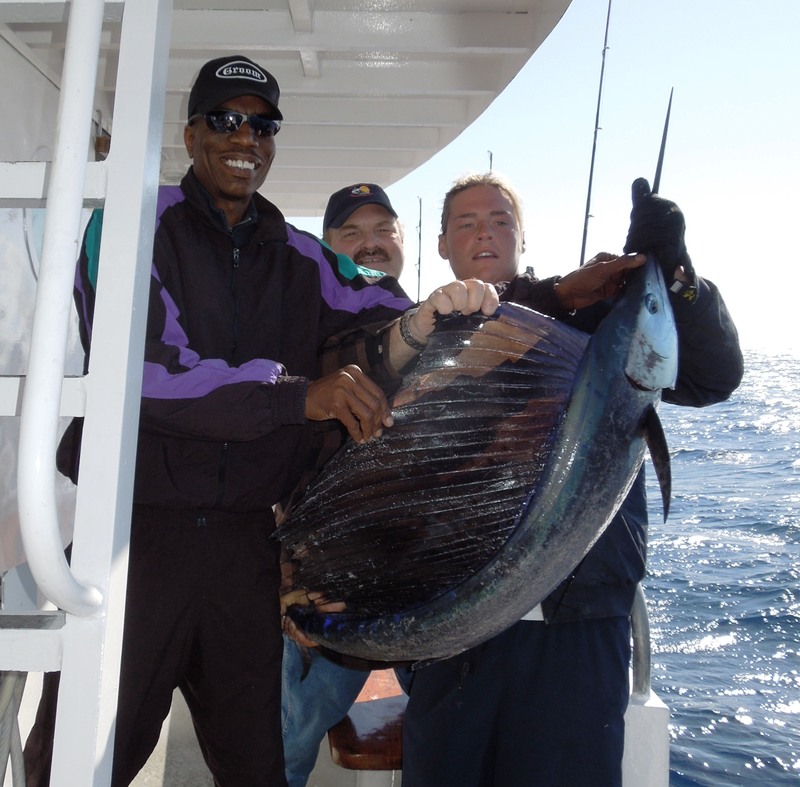 There were 9 total on the trip and everyone caught something which was either the sailfish, wahoo or tuna. 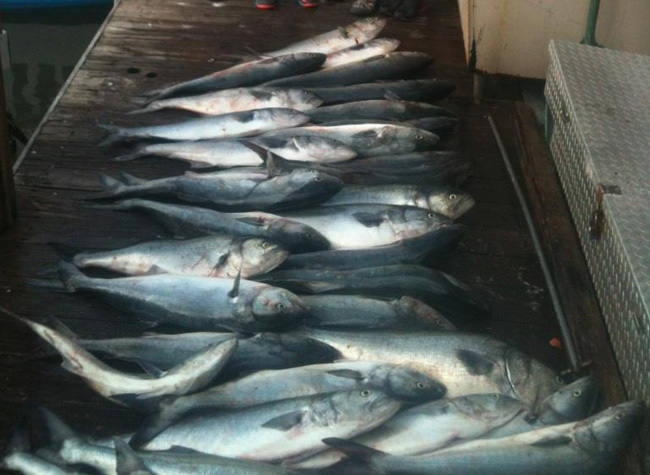 A lot of small-medium size blackfin tunas are biting out there. We saw a bunch of porpoises go by the boat and also saw much larger sailfish jumping out of the water further out. We call these “free jumpers”. It’s been good fishing these days in Fort Lauderdale. A lot of action and good variety of fish out there. 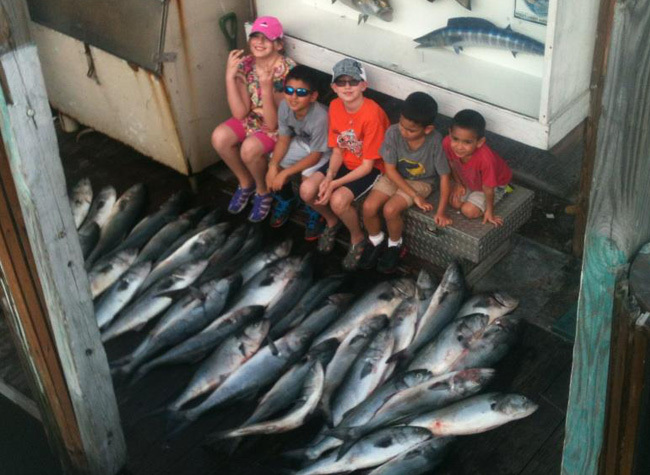 Both the drift fishing trips and our sportfishing charters are coming in with good catches as of late. This is always our best fishing season of the year for the nicer size gamefish. What an awesome day of drift fishing today aboard the Catch My Drift. Bluefish, which are not normally caught in Fort Lauderdale and are more of a northern fish, came through our waters with a bang today. We caught over 1000 pounds of fish in a half day trip… unbelievable! The action was non-stop for almost 2 hours. The school of bluefish was marking on the fish finder like a solid wall of fish 30ft below the surface. Under the boat, the water looked a lighter green color, because there were so many fish below just out of visibility. We brought back about 30 or 40 for people that wanted to take their fish home, and released probably twice that many. Every one of them was 10 pounds or bigger. That adds up to over a thousand pounds of fish! Bluefish had been biting all week in Fort Lauderdale, but today the bite was off-the-chain and the best I’ve ever seen it. I remember about 10 years ago, we had these big bluefish come through our waters in big numbers like this, but I haven’t seen it since and never this good. We do catch the small bluefish (snapper blues) on the night anchor trip pretty often. They are the ones you have to measure to see if they meet the size requirement of 10 inches. The ones we’re catching right now, on the day trips, are 10 pounds and over 30 inches! Strap in for some awesome action this week on bluefish. Also, BIG GAME ALERT: MAKO SHARKS MAINLY FEED ON BLUEFISH AND WILL FOLLOW BEHIND THESE SCHOOLS PICKING OFF WEAK AND INJURED FISH. OTHER SHARKS WILL DO THIS TOO. If you’re looking for a big game shark fishing charter, charter our sportfishing boat for a private shark fishing charter. The odds of catching a monster game-shark are good! What an off-the-scale fishing charter we had today. 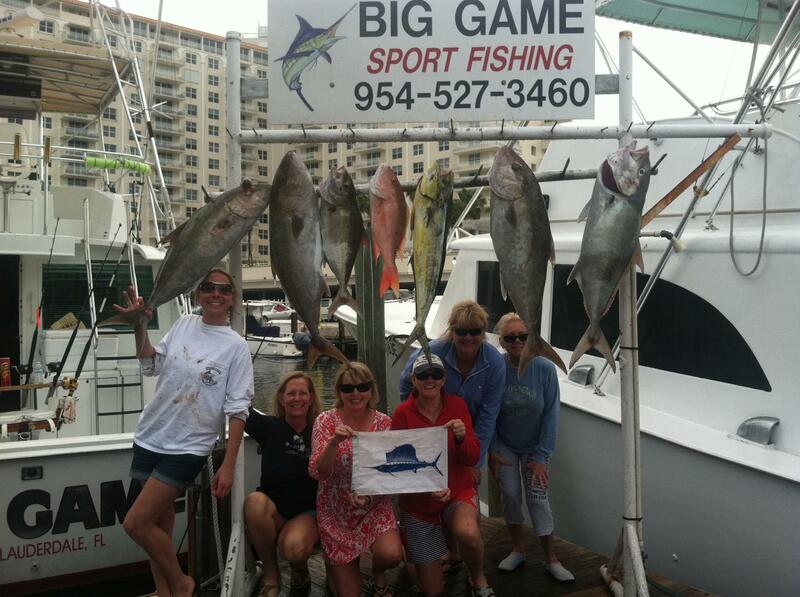 Capt Rod was aboard the Big Game and took out 6 women on a deep sea fishing charter. They said they wanted action but would like to catch something big too. With the objective set, we set out for fishing. Our first stop was to go kite fishing on the reef as the best bite had been early in the morning the day before. This was a good plan because it wasn’t 1/2 hour with the kites out that we had a sailfish jumping behind the boat. It was a 7ft sailfish and with an experienced lady angler in the chair, we caught the sailfish in under 15 minutes. 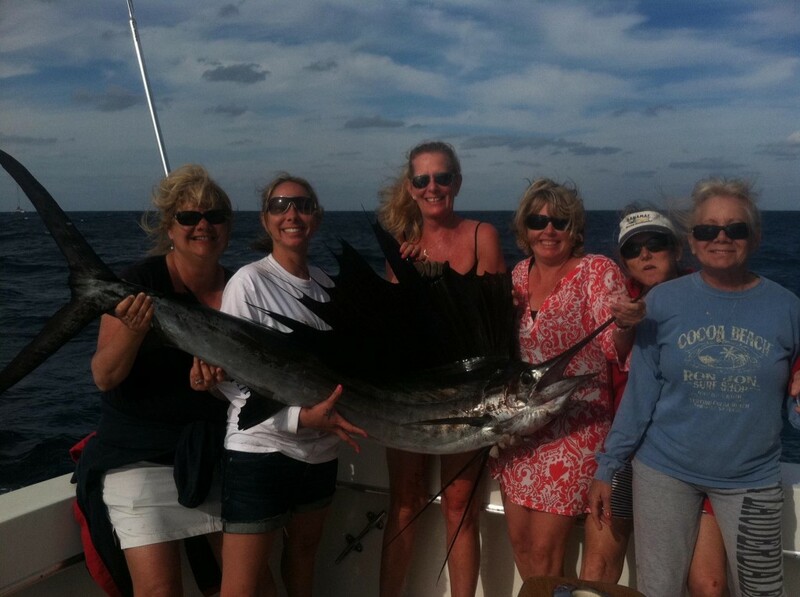 Ladies fishing trip with Fishing Headquarters- nice sailfish catch! With a sailfish already caught and the wind starting to die off, we reeled in the kites and went trolling. Within a few minutes of trolling, we had a nice mahi-mahi on the end of the line… a nice find in only 150ft of water. We trolled a while longer with a few mystery hits that didn’t get hooked. When we got up to the north, just off Pompano Beach, we started doing deep drops on some shipwrecks we know in 300ft of water. The bite was AMAZING!!! Almaco jacks were snapping, we could hardly get a bait to the bottom. Every single drop we caught a nice fish. The first couple were almaco jacks. 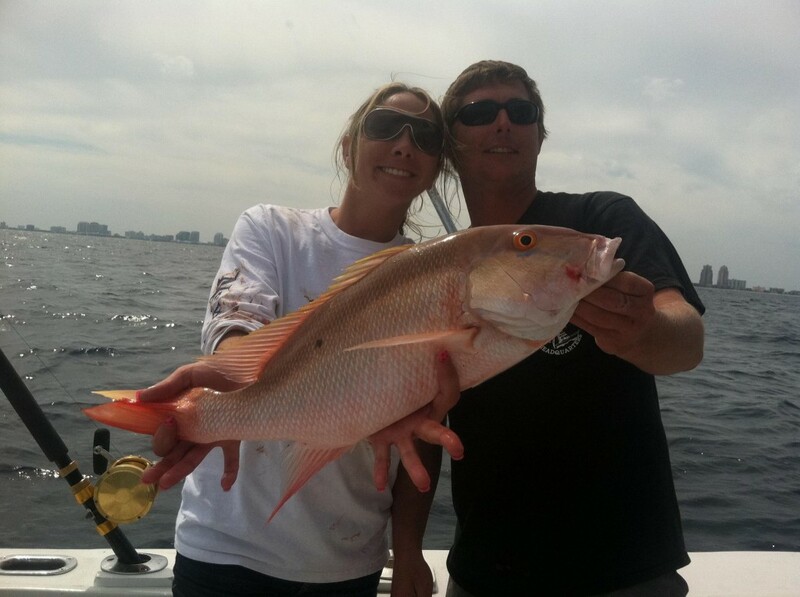 Then we caught a nice mutton snapper….. and then another almaco jack…. 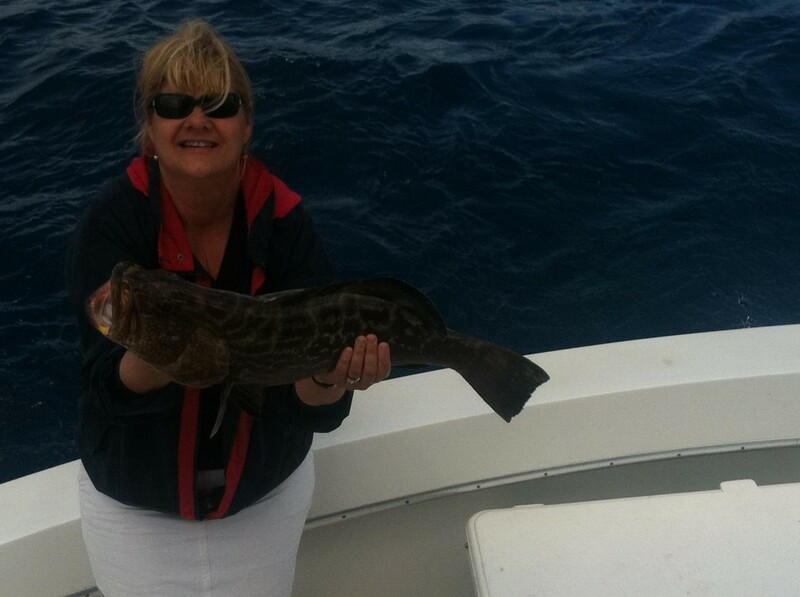 and then a 20 pound black grouper…. and then another almaco jack. The bite was awesome, better than the fishing in Ft Lauderdale has been in a long while. We headed back to dock with a banner catch: 1 sailfish, 1 mahi-mahi, 5 almaco jacks, 1 mutton snapper and a black grouper. The Spring fishing season is finally here, a time when the deep sea fishing off the coast of Fort Lauderdale rivals the action of anywhere in the world. Good luck fishing the next few months everyone and enjoy the great fishing in Fort Lauderdale.